Illinois professor Pinshane Huang received a 2017 Packard Fellowship. CHAMPAIGN, Ill. — Pinshane Huang, a professor of materials science and engineering at the University of Illinois at Urbana-Champaign, is among 18 early career researchers to receive 2017 Packard Fellowships from the David and Lucile Packard Foundation. Huang’s group studies molecules and nanomaterials using electron microscopes to see each atom’s structure and behavior. Huang has pioneered methods to track each atom in a piece of glass as it bends and breaks, and to image defects in materials that are only a few atoms thick. The group’s research aims to produce next-generation nanomaterials for energy and catalysis – such as high-efficiency solar cells or batteries – and nanoelectronics such as flexible graphene-based devices. “As a Packard Fellow, my goal is to dramatically expand the types of materials that we can understand at the atomic scale,” Huang said. Huang earned a doctorate in applied physics from Cornell University and completed a postdoctoral fellowship at Columbia University. In 2015, she joined the faculty at Illinois, where she also is affiliated with the Beckman Institute for Advanced Science and Technology and the Frederick Seitz Materials Research Laboratory. 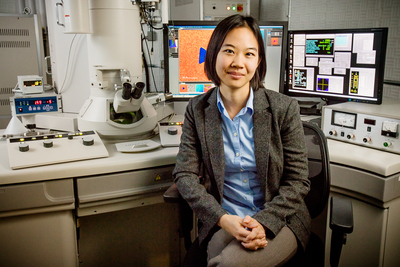 In addition to the Packard Fellowship, Huang has received a Young Investigator Award from the Air Force Office of Scientific Research, the 3M Non-Tenured Faculty Award and the Albert Crewe Award from the Microscopy Society of America. Editor’s notes: To reach Pinshane Huang, call 217-300-2574, email pyhuang@illinois.edu.